This medal was struck as part of the efforts by the exiled Stuarts to project their authority as monarchs. The motto, 'Reddite' meaning 'Give it back', refers to the throne. The medal shows that the Stuarts were still wedded to the ideal of 'Great Britain', while Ireland and Scotland are shown as distinct and separate kingdoms. England, the largest and wealthiest of the three countries, is labelled as 'Brit'. The title of this fine Dutch spotprent, or satirical engraving, can be translated as 'let the first to fall pay for all'. 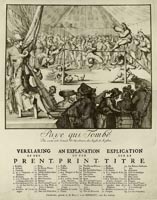 It shows the monarchs of Europe in the eighteenth century as rope dancers in a circus, jousting to knock each other off the rope. The Stuart claimant is unkindly shown as a pathetic spectator peeping into the tent as if unable to afford the price of admission, since he has lost his kingdom and is no longer eligible to play. Though the exiled Stuarts promised to annul the 1707 Treaty of Union, they remained committed to the principle of personal monarchical authority over the kingdoms of England, Ireland and Scotland. The clash between the Stuarts and Hanoverians is often portrayed as a confrontation between those seeking the restoration of the Scottish parliament and those owing allegiance to the new British state. Yet, in different ways, the Hanoverians and Stuarts were both unionists. The conflict between them was rather over which institution - monarchy or parliament - would control constitutional arrangements. However, for those Scots unhappy at the loss of Scotland's independence, Jacobitism was the only means of reversing the 1707 agreement. The succession of a German dynasty, the Hanoverians, to the throne in 1714 complicated Britain's relationship with a number of European powers and further undermined the legitimacy of the union in the eyes of many Scots. Over the next few decades Britain found itself in dispute with Russia, Sweden and Spain. Despite Britain's problems the Stuarts remained on the margins of the European political stage, mere spectators to the struggle between the great powers.